An article in BBC News has reported that scientists at the University of East Anglia are running a one year trial to see if eating chocolate can reduce the risk of heart disease in women with diabetes. However, it is not the ordinary chocolate bar that you can get from the supermarkets. The women in the trial will be consuming one chocolate bar every day for a year. The chocolate bar has been specially formulated so that it contains more flavonoids than is usual and also soy, another source of flavonoids. It must be reiterated that the chocolate bar has been specially formulated and not just any kind of chocolate bar. 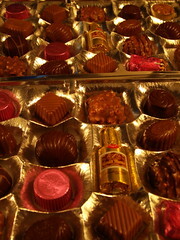 Eating too much chocolate is not advisable as it is high in fat and sugar.